The coastline in Devon’s far north-west corner between Hartland Point and the Cornish border is possibly some of the most dramatic in the whole country. It faces 3,000 miles of open Atlantic Ocean, and a combination of the power of the sea and unusual geology has resulted in a landscape of jagged cliffs fronted by long bony “fingers” of rock stretching out into the sea. Not surprisingly, this coast is of great danger to shipping, resulting in numerous wrecks in the area. It is in recognistion of the danger that the name Iron Coast has been applied. Picturesque on a good day, this walk can also repay the effort on a windy winter’s day, the wild sea showing the Iron Coast at its most impressive. Car parking is available in the village. 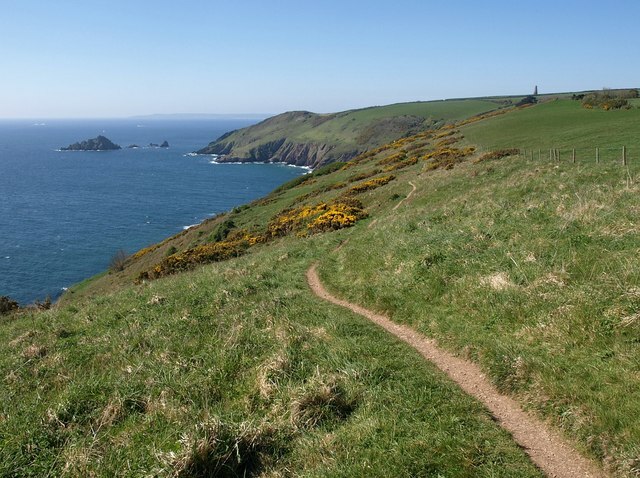 This walk starts and finishes in Hartland, a small isolated town which serves as the main centre for this part of Devon. It dates back to Saxon times when it was known as “stag island”- although never an island, its isolation made it regarded as such. Originally the property of King Alfred the Great, it later passed to Lady Gytha, the mother of King Harold of Hastings fame. Later, in medieval times, it was created a borough and in 1280 it was granted a market as well as an annual fair. However, it was always too isolated to thrive greatly and the market ceased about 1780. Hartland Abbey was established with a church by the Saxon Lady Gytha and was re-established by the Normans in 1169. Following its dissolution by Henry VIII in 1535 it became a private property and was rebuilt in 1779. The walk follows the former carriage drive, originally built to avoid the steep road between the town and Abbey. The Abbey is open to the public during the summer but check opening days and times. At Speke’s Mill Mouth is a splendid waterfall, with a drop of some 50m / 160 feet. Coastal waterfalls such as this are a geological rarity, although there are a number of others along this coast. They are a result of rapid erosion of the coast combined with “young” rivers rising only a few miles inland. Behind St Catherine’s Point (or Tor) is an unusual dry valley which once was occupied by a stream which changed its course to the north. The Point itself is an old sea cliff whose seaward side has been eroded away. The thousands of miles “fetch” of the Atlantic swells result in pressures of several tons per square foot being exerted on the cliffs, resulting in the sometimes spectacular erosion. 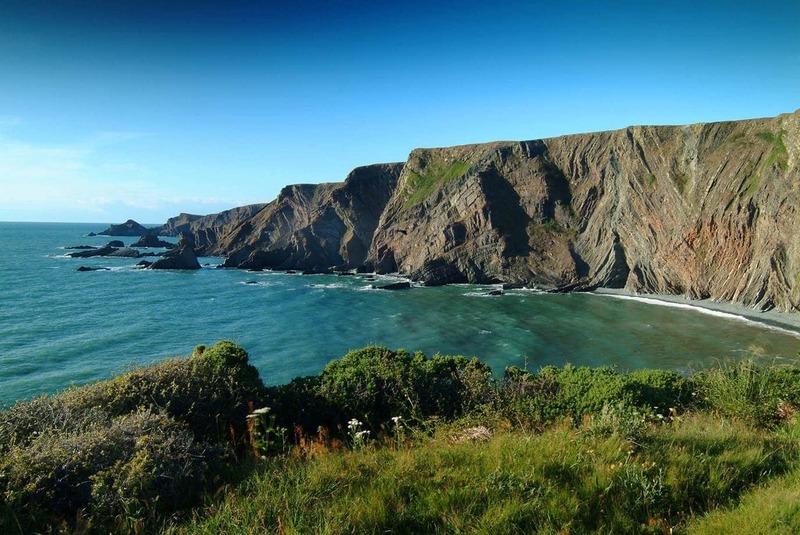 Hartland Quay has existed since the late 1500s and its sponsors included Drake, Raleigh and Hawkins. However, the Atlantic storms always made maintenance difficult and it was finally abandoned after being inundated in 1893. The harbour buildings were converted into a hotel and shop. It is a fascinating place to visit, especially the little museum of shipwrecks. A walk to the beach shows some of the cliff strata at their most impressive and there are also good views of the rock “fingers” stretching out into the sea. Above the Quay on the cliff-tops is an area known as the Warren, so called because it was used to raise rabbits for meat in former times. From here you can see the “golf-ball” of the navigational aid at Hartland Point with Lundy out to sea. St Nectan’s Church at Stoke was founded here in Saxon times by Gytha, mother of King Harold as a thanksgiving for the rescue of her husband from a shipwreck. The present building dates from 1360 and is both interesting and beautiful with a superb tower of 39m / 128 feet and used as a landmark for shipping.